Manning contends that Union soldiers advocated for emancipation as early as the second half of 1861, ahead of civilians, political leaders, and officers, and a full year before the Emancipation Proclamation. What This Cruel War Was Over will no doubt give Civil War enthusiasts a great deal to ponder, given the continued resistance in some circles to acknowledging the central role that slavery played in both the cause and the outcome of the war. 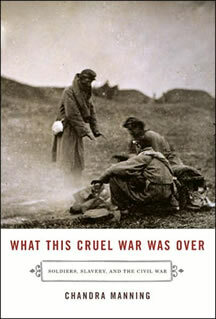 What This Cruel War Was Over: Soldiers, Slavery, and the Civil War, by Chandra Manning (New York: Knopf, 2007). EVER SINCE BELL I. WILEY published his seminal studies, Johnny Reb (1943) and Billy Yank (1952), historians have examined Civil War soldiers to better understand, among other issues, the history of American race relations, class conflict, ethnic identity, and national memory. One of the central questions that has emerged in recent years addresses why men went off to fight in 1861, and how they persevered through four years of horrific bloodletting. Historians such as Gerald Linderman, Reid Mitchell, Earl J. Hess, Randall Jimerson, and James McPherson have all offered explanations that explore a wide spectrum of motivating factors; these include religion, Victorian concepts of manhood and courage, and the strong bonds of esprit de corps and camaraderie forged by the realities of battle and camp life. While Wiley and others failed to explain the ways in which Americans framed the war in the abstract language of politics and ideology, most historians today acknowledge that the men on both sides of the Potomac were motivated by competing definitions of self-government, equality, and liberty. Manning surveys the archival records of 657 Union and 477 Confederate soldiers, along with regimental newspapers, to tell the story of how slavery and race influenced the men who volunteered and fought through the Civil War. She surveys soldiers from all theaters, native-born and immigrant Union enlisted men, non-slaveholding and slaveholding Confederate soldiers, and United States Colored Troops. For those familiar with the relevant historiography, many of Manning’s interpretive points will sound familiar. In 1997 James McPherson published With Cause and Comrades (Oxford University Press), which provided one of the most sophisticated accounts of how slavery and race shaped the political and ideological outlooks of soldiers in both armies. Manning adds to the debate by analyzing these views over time, in hopes of uncovering the often-subtle ways in which soldiers’ statements about slavery evolved. Perhaps one of the most interesting claims made in this book is Manning’s contention that Union soldiers advocated for emancipation as early as the second half of 1861, ahead of civilians, political leaders, and officers, and a full year before the Emancipation Proclamation. “Enlisted soldiers came to the conclusion that winning the war would require the destruction of slavery,” writes Manning, “partly because soldiers’ personal observations of the South led many to decide that slavery blighted everything it touched” (47). Her claim that soldiers’ reactions to the horrors of slavery became useful to the Union war effort compliments research by Ira Berlin, who also maintains that interaction between slaves and soldiers steered the Lincoln administration towards emancipation. Such a bottom-up analysis places Civil War soldiers at the very center of the events that led Abraham Lincoln to issue the Emancipation Proclamation in September 1862. Most Northerners had little direct contact with slavery before the war, apart from various printed sources, so whom and what Union troops saw in the South dramatically shaped their thinking. It is important to note that Manning does not conflate slavery and racism when interpreting the written record left by Union soldiers. She clearly demonstrates this fact in her analysis of white Union soldiers who took part in the battle of the Crater in July 1864. The failure of the Union Ninth Corps to breach the Confederate lines at Petersburg led many soldiers to look for an obvious scapegoat; they found one in a division of United States Colored Troops that had participated in the failed assault. When voicing frustrations over the battle, many white troops did so in overtly racist terms. Still, by 1864 there appears to be sufficient evidence, according to Manning, that a significant number of soldiers felt compelled to confront their own racial prejudices, though they varied in the degree to which they seriously considered the concept of racial equality. While the notion that Union soldiers did in fact pay careful attention to the issues of slavery, race, and emancipation is an important corrective to our tendency to see Civil War soldiers as apolitical, Manning’s conclusions about Confederate soldiers are also important. By placing slavery at the center of her analysis of Confederate soldiers, she challenges readers to rethink assumptions about how slavery figured into the lives of most white southerners. While other issues certainly animated Confederates at different times, Manning argues that the issues of race and slavery served to focus the army. She examines how even non-slaveholding Confederates were motivated to fight by the belief that abolition would erase the privileges of white manhood, endanger their families, and destroy the very fabric of Southern society. Internal fissures may have threatened the unity of the Confederacy, but these problems never trumped the importance of defending the “peculiar institution.” Regardless of status, white southerners held to the belief that the survival of slavery guaranteed their respective place in the political/social hierarchy. Most important, they feared that defeat would likely lead to race wars and miscegenation. When focused on Confederates, Manning’s analysis takes on a reductionist tone in its tendency to interpret a spectrum of reasons for joining the ranks as an extension of one basic motivation. While both sides claimed to be fighting for freedom and their understanding of the Revolution, Confederate notions could not be divorced from individual interests, or from slavery. Manning provides ample evidence of how various arguments can and should be understood within the context of slavery. “Slavery played many roles,” according to Manning, which non-slaveholders considered to be vital to themselves and their families. Even the argument that Confederates were defending hearth and home must be understood ultimately as a defense of slavery. Letters, including promises to defend home and loved ones, dramatized the myriad ways in which slavery impacted the lives of white southerners on a personal level. Manning concludes that Confederates were committed to defending their property as an expression of this “understanding of liberty.” And non-slaveholders did not have to own slaves to understand the necessity of its survival: their individual freedom depended on the continued enslavement of southern blacks. The institution of slavery guaranteed ideas of liberty since it guaranteed white egalitarianism and prevented the amalgamation of the races. “Non-slaveholding Confederate soldiers regarded black slavery as vital to the protection of their families, interests, and very identities as men,” writes Manning, “and they relied on it to prevent race war” (39). The survival of their families through Confederate independence also included the hope of one day becoming slave owners themselves. What This Cruel War Was Over will no doubt give professional historians and Civil War enthusiasts a great deal to ponder. However, it is the latter group that stands to benefit the most from this study, given the continued resistance in some circles to acknowledging the central role that slavery played in both the cause and the outcome of the war. A quick perusal of message boards, blogs, and listservs suggests that a wide range of readers are indeed reading and discussing the book. Manning’s study reminds us that the Civil War was not simply a slugfest between two armies, but a war about whether the United States would continue to be a slave-owning nation. Ultimately, her work demonstrates that the ideologies of soldiers themselves figured prominently in the outcome of that contest. Copyright © 2007 The Ambrose Bierce Project and Penn State University. All rights reserved.